Opera is embracing the virtual world with Instagram, the photo-driven social media platform that now has an active community of classical music fans and industry users. Typing “#opera” into its search bar yields more than three million posts. Many of those posts are coming from performers who see the platform as a way of connecting with their fans. But for others, it’s becoming an important part of developing their career. Instagram has become a tool that helps boost a performer’s chances of getting work, as opera houses – many of which are struggling to fill auditoriums – see an opportunity to sell tickets by hiring a performer who is popular online. And artists aren’t just going it alone. Some see a well-curated feed as such a vital step in getting the attention of directors and others involved in the casting process that they’ve turned to professional communications experts to cultivate their brand and build their online presence. “We aren’t directly selling a product to our followers.” says Olivia Renaud, a Paris-based American communications specialist who works with tenor Benjamin Bernheim and soprano Nadine Sierra. But, she says, “we’re potentially selling tickets” by showcasing performers. Elizabeth Bowman, who runs classical PR firm Bowman Media. So while opera superstar Anna Netrebko is renowned for her voice, her Instagram presence (she has close to 400,000 followers) certainly helps to promote her. Netrebko also posts photos of food, family and friends in order to help her demonstrate that opera stars have lives just like anyone else. 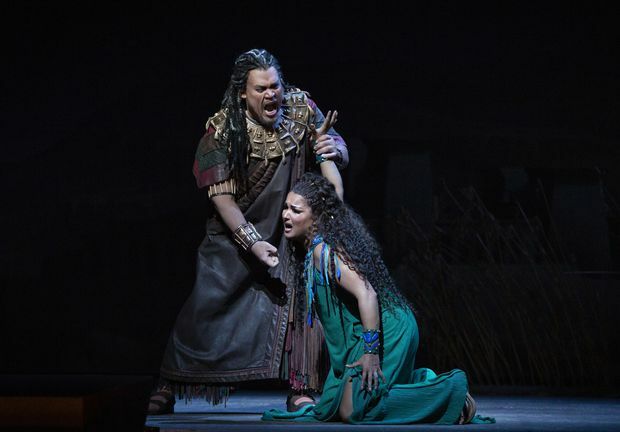 This image released by The Metropolitan Opera shows Quinn Kelsey and Anna Netrebko during a performance of Aida, conducted by Nicola Luisotti, in New York. Israeli soprano Chen Reiss in Der Freischutz.